The Book Rat: Blogger Ate My Homework: An FTF note + 1 last (awesome) guest post! Blogger Ate My Homework: An FTF note + 1 last (awesome) guest post! You guys. Blogger ate my homework. I got an email yesterday from an FTF guest poster, wondering where her post ended up on the schedule. Knowing that I had it on my paper schedule around the middle, I found it curious that she couldn't find it - and the realized that I couldn't find it. I knew Ashley and Bonnie had a little trouble with Blogger eating up posts this time around, and though I'd had a few issues early on, I thought I'd caught them all. Uh, no. Not only did it eat Megan's very lovely post, but 3 others as well (at least, I've found 3 and hope that is all). Which I now have to completely rewrite. So except some random fairy tale goodies to pop up sporadically, and until then, enjoy this still very lovely post from Megan @ The Dark Forest!! And if you had an FTF guest post that you sent me but don't see on my or Ashley's blogs, please email me so I can track it down! Fairy tales are in! For us fairy tale nerds, its so exciting to see them explode all over the popular culture scene. However, film producers seem to be just skimming the surface of fairy tales. In the twenty or so fairy tale films and tv shows coming out, we have started to see a pattern: three Snow Whites, two Sleeping Beauties (not counting the one that came out last year), two moreCinderellas and three Beauty and the Beasts (Full article). This is in addition to the hundreds of movie adaptations of these four stories already out there. This story is much like Beauty and the Beast, but with a much longer journey for our heroine. The girl lives with her poor family until one night when a white bear knocks on the door and demands the girl in exchange for making the family rich and prosperous. To save her family she goes. She travels a long way on the bear's back until she comes to his mountain castle. There, during the day, she has everything she ever wanted, but only the bear for company. But at night, a visitor comes to her room, and sleeps in her bed. She is never allowed to look at him. One night, when she visits her family, her mother freaks out, saying that whoever might be sleeping with the girl might be a monster. The girl is over come by curiosity, and the next night, she looks. She sees the most beautiful man asleep there. She accidentally splashes candle wax on him and he wakes up. He cries in horror, for he is a prince, turned into a white bear by day by a curse. If she had held out a little longer, he would have been free, but now he must go and be groom to the troll queen. When the girl wakes up the next morning, she is alone on a hillside, the castle and the bear gone. She decides to undertake a long, harsh journey, and go through many trials to make up for her mistake, and save her prince. A king's wife is dying, and he vows he will never love another woman, unless she is as beautiful as his wife. Turns out, that woman is his daughter. In order to keep her father at bay, she says she will marry him if he gives her a dress the color of the sky. When he unbelievably does, she tries again with a dress the color of the moon, and then a dress as bright as the sun. When he suceeds in all of these, she asks for a dress made out of the skin of his favorite donkey (who poos gold). 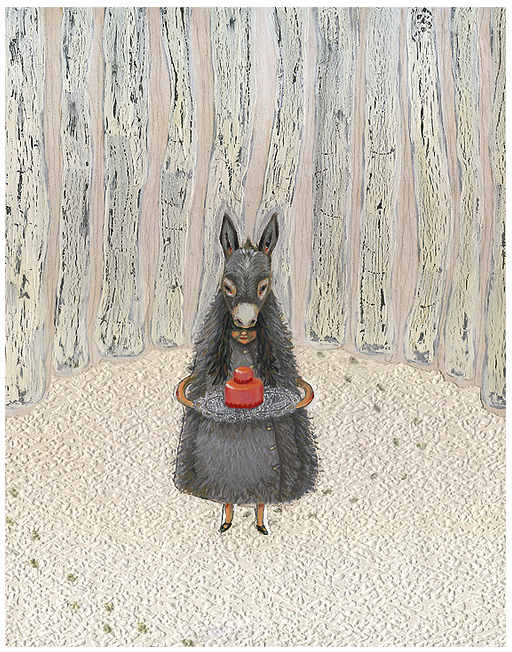 When he sacrifices his donkey, she can think of nothing else to put him off, so she runs away disguised in the donkey skin. She goes and finds work in a royal farm, where everyone shuns her for her ugliness. The prince, however, sees her in a rare moment when she dresses up in her beautiful gown, and is determined to have her. She is shunned for her ugliness, and works the lowest jobs at a farm until a prince sees her for who she truly is. A king begins to loose all his huntsman in the forest, and discovers and captures a wild man. The wild man is chained in the palace near where the young prince plays with his golden ball. One day the ball rolls into the cage, and the wild man will not give it back until the prince sets him free. The prince does, and the decides to go with the wildman, whose name is Iron Hans, to the forest where the prince is tasked with making sure nothing falls in a sacred well which turns things into gold. Once, he lets a hair fall in, the second, another hair, then, he falls asleep, and his head drops, and all his hair falls into the well, turning it into gold. As punishment, he is banished, but with the promise from Iron Hans that if he asks, everything he needs will be given to him. He goes to work as a gardener at a neighboring kingdom's palace, where everyone makes fun of him. The princess is intreagued by him, however, and they engage in witty banter. When the kingdom is threatened, he goes to the forest to ask Iron Hans' help, and receives armor, a horse, and an army, and saves the day. He runs away after battle, not wanting acknowledgement. The princess has an idea of who the mysterious hero is, though, and she devises a plan to get him to reveal himself. There is a king whose twelve daughters are locked in their rooms every night, and in the morning, all their shoes are worn out, like they have been danced in all night. The king promises his kingdom, and one of his daughters, to the man who can figure it out within three days, but if the man does not, he is put to death. A soldier comes and does not drink the sleeping potion the daughters snuck into his drink, dons an invisibility cloak, and follows them down to a magical realm where they dance the night away. Only the youngest daughter senses something is there. On the third night, the soldier brings back a golden cup as proof and tells the king, and marries the oldest daughter. While on the surface, it seems to be a misogynistic story, I think a lot of fun could be had with the cleverness of the sisters, the relationship the soldier builds with them while he is there, and the nature of the realm of dancing. A girl meets a dashing young man who asks her to marry him. He tells her first that he must visit her in his house in the woods. She is a little worried about it, so she keeps making excuses, but he slaps them all down. He tells her he will leave her a trail of ash so she will find her way. She leaves her self a trail of lentils so she will find her way back. She gets there and is warned by an old woman inside that she has come to a murderer's den. She hears the man coming home and hides. He comes in with a girl, kills her, and chops her up. Her finger flies over into the hidden girl's lap. There is a ring on it, and she puts both the ring and the finger in her pocket. While the robber eats the girl, our heroine escapes. The ashes have blown away, but the lentils have sprouted, and she is able to get back to the village. At her wedding the next day, she bravely stands and tells a story to the village that literally points the finger at her husband to be. These could all be done with straight-up retelling, or exciting adaptations. Robber Bridegroom would make a fantastic horror film. There are hundreds of fairy tales out there, so there is no reason to try to squeeze another interpretation out of the same four tales. What do you think? 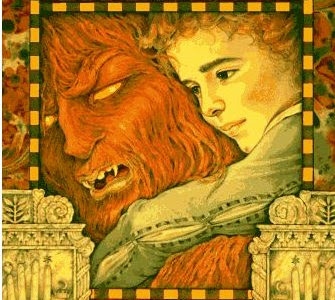 What are your favorite lesser known fairy tales that you would like to see made into movies? Wonderful post! I totally agree with you. While I enjoy another Snow White movie, it has been driving me crazy that we're not doing other tales! Yes, they are only sticking to the very well known ones or the Disney'd ones. I want them to dig deeper and get their hands on them before Disney does. Imagine the dresses in the Twelve Dancing Princesses!!! Oh God, I can see them now. I want that movie, if they'd just follow Heather Dixon's book it would be perfect!